Planting Perennial Ryegrass: Lolium perenne L., (Perennial Ryegrass) is a bunchgrass which grows from 1 to 2 feet tall and has medium longevity. There are numerous long, narrow, stiff leaves near the base of the plant. The under surfaces of leaves are bright, glossy, and smooth. The stems are nearly naked. Seed heads are spikes with spikelets growing edgewise to the seed head stem. Seeds do not have awns (bristles). Employees of Valley Green had the pleasure of visiting one of our seed vendors in Arizona last week. 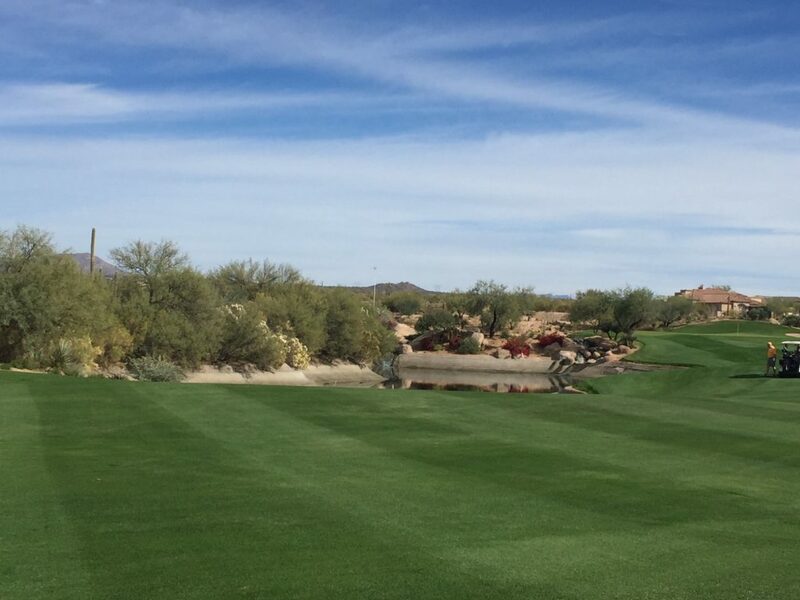 We also visited some of the golf courses that the seed company supplies the superintendents with Perennial Ryegrass. This type of grass is often used for overseeding grasses in the south while they’re going dormant for the winter. Perennial Ryegrass is a competitive grass for cooler weather. It prefers sun but will tolerate partial shade. Mixing Perennial Ryegrass with Kentucky Blue Grass can result in very traffic and disease resistant. It’s rapid growth also helps to suppress weeds. The normal seed germination time is 7 to 12 days. This type of grass can also be used to feed livestock. Perennial Ryegrass is native to southern Europe, the Middle East, North Africa and eastwards to central Asia. The time to plant Perennial Ryegrass is in fall when temperatures are cooler and conditions are complementary to the plant’s growth. The mowing height of the grass is about 1.5 to 2.5 inches. Though this is higher than normal, it helps keep the grass dense and perform it’s best. Though Perennial Ryegrass requires frequent irrigation to maintain it’s color, it recovers very quickly from droughts. It is also highly adaptable to both acidic and alkaline soils. Valley Green offers a large amount of Perennial Ryegrass for sale. Please visit our contact page to find a sales representative near you.